The colonial community at Bethlehem, Pennsylvania was a beehive of activity and enterprise. Bethlehem was a special place. 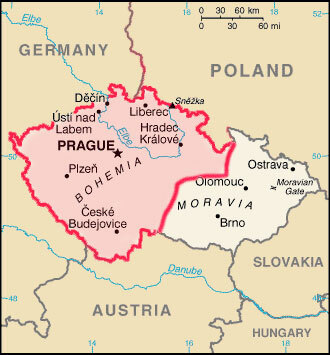 Here settlers with roots in Bohemia and Moravia (in what are now the Czech Republic and Slovakia)were given the chance to make new homes for their families. These settlers, called Moravians, were very religious people. The Moravians came to America primarily because America offered a great opportunity to spread God's word. They believed their purpose was to become missionaries to the Indians and other German families who lived in Eastern Pennsylvania. To accomplish this task—to be missionaries to Indians and German settlers—the Moravians built an amazing community, a model of what we might call the forerunner of a modern industrial complex. This was very unusual for colonial America. Most people who lived on the frontier worked very hard to build farms and produced only enough to feed their families. Since Moravians wanted to provide religious services to other people and not everyone could be a missionary (and missionaries had to devote themselves to visiting the Indians and other settlers and could not farm or do other work), they had to develop a system to support the work of missionaries. From the earliest beginnings of America, nearly all the people on the frontier worked to support only themselves and their families. Even in the 19th century,most communities were primarily agrarian, involved chiefly in the activities of growing food and tending stocks of animals. At Bethlehem, before the Revolutionary War, the Moravians managed to reverse the existing work model by employing 80% of their citizens in trades and manufacturing with only 20% working to support the entire community with food. That was a very important development, a new idea. This new idea attracted the attention of John Adams (then Member of the Continental Congress and future second president of the United States). 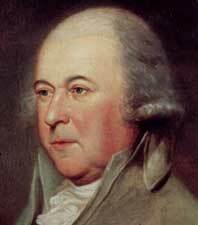 Adams came to Bethlehem in January of 1777. By this time, the Patriots had declared their independence from England (July 4, 1776). This was a dangerous time and war was a constant threat throughout the former colonies now struggling for their independence. Still, Adams found time to visit Bethlehem. What he found there amazed him. Adams called Bethlehem a “curious and remarkable Town,” immediately recognizing the importance of this community for the future of the United States—Bethlehem demonstrated what was possible: how opportunity, freedom, and liberty could be applied to build a prosperous and happy community. Adams had seen the future of America. What made Bethlehem so amazing? The center of the community was its manufacturing which spawned more than fifty crafts and industrial trades. One of the most important parts of the community was its system of mills, especially its gristmill which, provided everyone the flour to make his or her daily bread—the staple of the community. Here in Bethlehem, Old World technologies mixed with the opportunities of the New, creating unimagined results. At first, Bethlehem was controlled by Church authorities: as the nuclear family of husband-wife and children was unknown and individuals were separated by gender. All was done for the good of the community. This social-economic model worked as long as Bethlehem was relatively isolated from other communities. By the 1750s, just before the French and Indian War, the wider colonial world became connected to Bethlehem. The community began to trade tanned hides, linseed oil, food stuffs, and other products to outsiders in exchange for iron, gunpowder, glass, and salt. To improve trade, the Moravians established stores and inns for visitors and soon Bethlehem became a center of trade between Moravians and other colonial people. This greater trade increased wealth and prosperity. These new opportunities to make money also created a new demand among Moravian tradesmen and craftsmen, who began to establish their own businesses. Soon a new system of economics was established: market capitalism. Individuals set up their own businesses to sell and trade independently of church (or state) restrictions. This new opportunity created a strong independent entrepreneurial spirit among the Moravians and other colonial people. The Bethlehem experience was one indication among others that, long before the Revolutionary War, the beginnings of capitalism and a government system to support it were evolving in the colonies. While the Declaration of Independence created a new nation, it also confirmed and protected a new economic system that was to spread throughout the emerging United States of America. On that count, Bethlehem provides an excellent case study for the study of early American life and institutions; how Old World ideas and technologies were applied and improved in America; how freedom and liberty created unimagined opportunities to improve the lives of Americans. The section on 'Historic Bethlehem' in the 'In-Depth Articles' contains much informative material on Historic Bethlehem from the Historic Bethlehem libraries. In addition, the lesson plan material on Historic Bethlehem from the National Park Service provides a valuable resource for teachers (see links below). In learning about Bethlehem, teachers might begin with a list of colonial jobs or tasks. Building from earlier lessons on mills, mill technology, trades, and agriculture, teachers could identify how the community was organized. Teachers could discuss the relationships between fields, waterways, farms, homes, churches, stores, and manufacturing areas, including modes of transportation. To gain a greater appreciation and understanding of the organizational structure of Bethlehem, have children plot the various structures and places of work on a map. Teachers might also have their children color in the structures, fields, forests, water features, roads, structures, and other items: Colonial Pennsylvania Mills, Mills in Colonial Cities, Geography, Landscape and Mills. 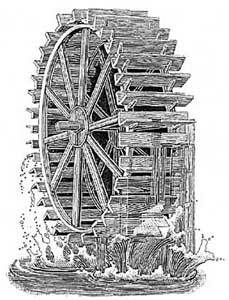 To understand how milling is closely connected to waterways, teachers will show how millers used the water to produce energy: The Three Types of Waterwheels. To understand and describe how mills operated, teachers will show basic models of mills: The Three Types of Waterwheels, Mills and Machinery from Medieval to Colonial Times. Next Step: What Products Did the Mills Produce and How Were These Marketed? We know that mills were a central part of every colonial community, especially the gristmill. Everyone needed corn meal and flour to make bread. Manufactured flour was of higher quality than stone ground products made by hand at home. Flour also differed in quality, as well as in the type of grain from which it was made. Teachers will explain the uses of flour in cooking and baking, the products produced in baking, and the distribution and sale of these products throughout the community. There were other sorts of mills at Bethlehem, which also very important to the community and its growth. In addition to the gristmill that made flour, a fulling mill and oil mill produced other needed products that were sold for cash and trade. Teachers will explain how the fulling mill featured power-driven technology that greatly increased the quantity of wool products. The oil mill was used to produce linseed oil that was pressed from flaxseed grown locally. The backbone of every successful colonial community was the quality and quantity of its food supply. With its agricultural practices and applications of advance technologies, the Moravians at Bethlehem were able to achieve a higher standard of living than was available in Europe or in other parts of the colonies. The success of Bethlehem was due to the blending and application of agriculture and industry. It is also important to note that the revolution of new technologies, ideas, economics, and manufacturing came in advance of the coming revolution in government. During the Revolutionary War, patriots established a government that would support and encourage this amazing pre-industrial world. The lessons learned at Bethlehem and other communities proved invaluable as the new American citizens transitioned from the colonial period to the early nation era. In thinking about the successes and failures of Bethlehem, teachers can lead students in discussions that require students to think about the inner-relationships necessary to build a strong community, the divisions of labor, the various tasks and trades, the importance of manufacturing, the need for genius of invention to improve technologies, increase output and wealth (capital), and raise the general quality of life for all. Explore the reasons why Bethlehem changed from a closed community to one more connected to life outside of Bethlehem, Pennsylvania. Colonial Bethlehem was established as a self-contained, independent, and self-sufficient community—a world unto itself. This concept of a self-contained community is readily understood by children, who psychologically interpret their own understanding of the world as the immediate community surrounding themselves). Building from this basic understanding, provide an overview of the Bethlehem community, the basic tasks of living, the daily work, planning, and construction (reminding the children that the initial underlying purpose of Bethlehem was its missionary work). It is now well known throughout the educational world, that given the application of No Child Left Behind requirements together with various state testing programs and schemes, the specific introduction and study of American history, civics, economics, and geography in elementary and middle schools has been radically altered, if not seriously impacted. Every teacher knows that the thrust of educational effort has been centered on the subjects of mathematics and language arts. While math and language arts (including reading and writing) are extremely important, it is problematic that what is tested is taught because, collaterally, what is not tested, is often not taught at all. In simple pragmatics, recognizing the prevailing structure of schooling—recognizing the diminished place American history holds in schools, the most effective means for teaching American history topics is through inclusion within language arts, specifically reading and writing exercises. The application of American history and in this case the study of colonial Bethlehem provides teachers with opportunities to cover not only crucial language arts standards, but also history and other related standards. The application of American history topics has collateral benefits for language arts. Specifically, American history topics spark interest and create enthusiasm. Language arts programs can provide only so much interest to children, and the presentation of historical people, the study of life in other times, the connection and continuity of colonial living to life in contemporary America brings depth and understanding.